Grace. Poise. Yummy, because of an occasional queso drip from the deliciousness that was The Three Amigos. Many words compare the Dallas Comedy House Night Interns to that of an American beauty pageant queen. However, many, many more words do not do that. While the DCH crew tends to be infiltrated by unreasonably attractive people, what matters more is the skill brought to the table by these pretty faces in order to keep our shows running. Walking around any standard Tuesday through Sunday night, patrons will run into two types of staff shirt-wearers: Black and Red. If you’re confused by whether it’s a DCH Team member, or Zach from Tinder wearing one of those two colors of shirts, check if the shirt says “STAFF” on the back. Pro Tip: Tinder dates tend not to wear these shirts in public, in case it means they have to do more work than swipe one finger. Team Black are your Night Interns. These guys and gals make sure the show goes on, and man does it take work to make each of our 1,000+ shows a year run smoothly. The ‘Terns do just about everything! Checking your ID at the podium as soon as you walk in the door? Intern! Selling your tickets to you? Intern. Announcing (ahem, what we call HOSTING) before the show? Intern. Bussing tables, so you have room for that PBJ/PBR combo? Intern, baby*! 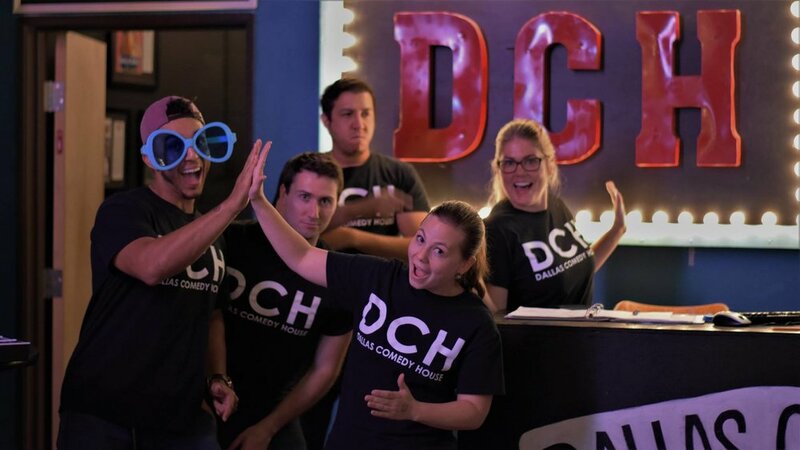 Each of these night-shaded shirt sheeple work hard for a clean, fun environment at DCH, so all you have to do is sit back and relaugh. Plus, they love showing off their brain muscles by answering any questions you may have. In return, interns get free comedy classes at the Training Center, so eventually they’ll be smart, pretty, AND, funny. Wowza. Team Red are your bar buddies and waitstaff (not to be confused with the Team Red Pokémon bad guys, the bane of 6-year-old 90’s kid’s existence). They take your drink and food orders from either show or bar, skillfully mix your double vodka sodas with lime, and make sure you’re all good on that tab you expertly remembered to close at the end of the night. While also smart, pretty, and funny, they get paid in real people dollars instead of classes, so remember to tip. Either way, look for the DCH Staff then next time you have a question (or compliment) to dole out! *All our interns are adult humans and are not infants, hence the comma. Baby is just a pet name for great article readers, like yourself. Michaela is a full-time jokester and a part-time blog intern for the Dallas Comedy House. She is currently signed up for her first class in stand-up comedy and her third class in improv at DCH. If you’re in need of someone to laugh at puns with, she’s unfortunately your best option. You can catch her drinking a double vodka soda and guffawing at nearly every Tuesday night Improv jam – stop by and say hi.